During one of my routine E-bay searches I stumbled across these. Now I know they may not be the $325 Alexander McQueen Black Ombre Sunglasses but I think hope they will relieve my shopping addiction for now. 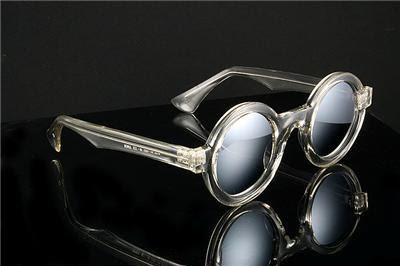 Some of the circular style sunglasses are a little too serial killer for my likings, but these came across more Gaga/John Lennon to me. 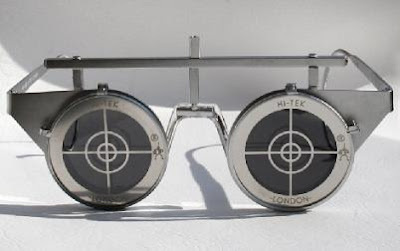 If you're looking for affordable/unique eyewear and want to break away from the Ray-ban Wayfarer this Spring/Summer, check out London based designer Alexander Hi-tek. PS. I bought the ones with the clear frame and mirrored lenses. I personally think round glasses will never go out of style, but then it also depends on which context you wear it for. I mean something John Lennon would wear is still fashionable today, no? best example is round glasses, thanks to GaGa! I adore the first pair! and thanks for the compliment honey! you are fabulous yourself, loving that platinum hair and bangs! I see you are friends with Peter! loves it! Have a great New Year! delicious. you are def on to something here. These are soooo beautiful!! can't to seee what they look like onnn!